Summer is a great time to frolic in the woods, but look out for poison ivy, oak, and sumac! Top tips for summer itch-prevention. L-R, poison ivy/oak/sumac. Image via Kerry Wixted, carbon NYC, USDA. Why do these plants make you itch? Aside from being flowering plants, members of the toxic trio bear little relation to their benign namesakes. * But they are related to each other. All three belong to the same genus – Toxicodendron – and share the same itch-producing component – an oil called urushiol. It’s a fierce skin irritant. According to the Centers for Disease Control, between 80 and 90 percent of the U.S. population exhibits an allergic reaction to urushiol, and at doses as low as 50 micrograms (less than a grain of salt). Urushiol is found it all parts of the plant (leaves, stems, even berries). It seeps from any damaged portion and stays active for, ugh, one to five years. While the leaves generally bloom from spring to fall, even the dead and withered remains of the plants can be sufficiently coated in urushiol to cause bouts of wintertime itching. Tall poison ivy. Image via Jaknouse. Where are they most likely to be? 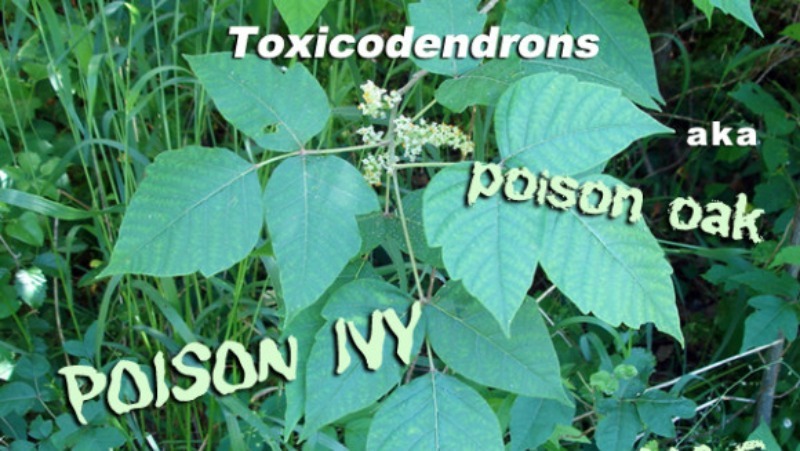 Toxicodendrons are native to North America, with most U.S. states (and several Canadian provinces) being home to at least one, if not all, of the dreaded poisoners. They’re frustratingly varied in appearance. Poison oak and poison ivy usually (but, sigh, not always) exhibit the infamous “leaves of three” configuration, but poison sumac sports anywhere from seven to 13 leaves. Leaves vary in color depending on the season, and growth patterns can be different even within the same species. Sometimes they’re shrubs, other times vines. 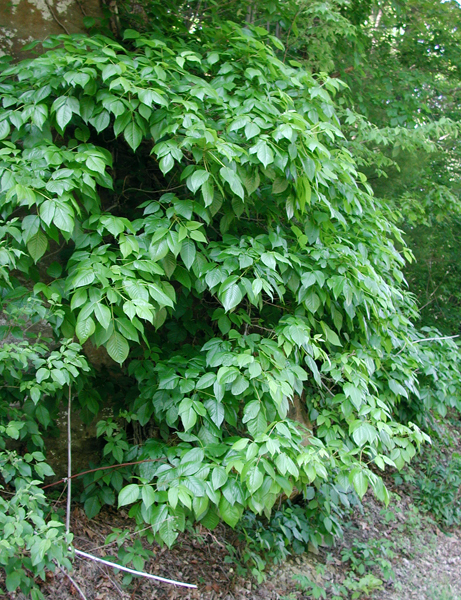 Master of disguise poison ivy (Toxicodendron radicans) can be a shrub, a trailing vine, or a climbing vine. Good luck staying out of its path. Poison sumac (Toxicodendron vernix) is considered the most potent of the three, but luckily it doesn’t have the widest distribution. That honor goes to the frighteningly ubiquitous poison ivy. Bad dog! Wait here while I get the hose. Image via HunterJumper. Look what the cat dragged in. And if picking up allergic contact dermatitis (medical lingo for miserable plant rash) directly from the source weren’t enough to worry about, you can also get it from your outdoor-loving pets. Cats and dogs don’t seem terribly affected by urushiol, and they’re more than happy to carry it home to you on their furry little backs (and heads, and paws … what a mess). 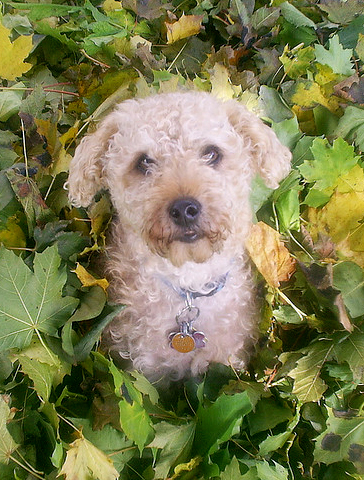 As with anything else that comes into contact with vicious Toxicodendrons, your pet will require thorough washing. Some animals are so unfazed by urushiol, that they can eat the poisonous plants that cause our species so much grief. Birds consume the berries, deer and other mammals enjoy munching on the leaves. Some birds even use poison ivy vines as nest-making materials (note to self: stay far away from bird nests). All this means amply broken, urushiol-oozing plants for you to encounter on your next summer picnic. 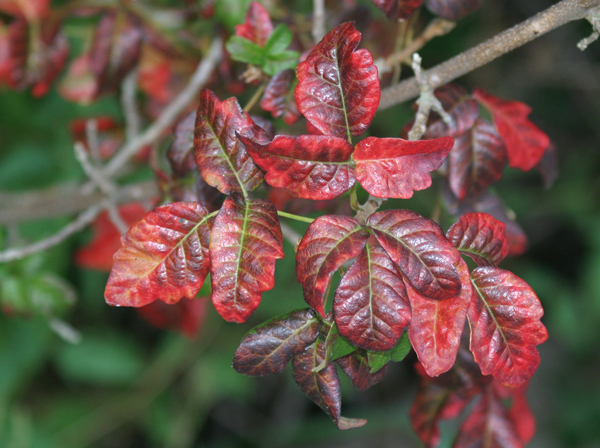 Poison oak in red, like your skin after touching it. Image via DavidDennisPhotos.com. Top tips for sufferers. Some individuals are more profoundly allergic to urushiol than other, and the degree of reaction can change over time. The rash and blistering caused by the toxic oil is slowest to develop after the first exposure. During subsequent interactions with itchy plants, the body freaks out faster. A number of people seem keen on the idea of building up a tolerance to urushiol so that they can march through poisonous flora with impunity. This isn’t complete insanity. Dermatological experiments on humans have demonstrated some success with this kind of desensitization, though the benefits weren’t always long lasting. However, do note that such studies were done under controlled conditions, using intramuscular injections of urushiol or pills designed to protect the digestive tract from the chemical’s full assault. Should you go out and eat a fistful of poison ivy to see if you can approximate their results on your own? I think you know the answer to that question (hint: it’s NO). Contrary to popular belief, poison ivy/oak/sumac isn’t contagious, nor does it spread to other parts of your body (though it may seem like it does because the rash takes time to fully materialize). The only way it can be transmitted is through contact with the oil itself, so if you find yourself afflicted with the rash it’s important to track down every last trace of urushiol. DO: Wash your skin thoroughly the instant you realize you’ve come into contact with itchy plants. If urushiol is washed off before it is fully absorbed into the skin, you can minimize the damage. You’ve got about 10 minutes, so get moving. DO: Wash everything else that may have touched the poisonous plants. Clothes, shoes, water bottles. Friends and family members. Everything. DON’T: Attempt to destroy the offending plants or any contaminated items with fire. Urushiol can become airborne when burned, and you do not want to be inhaling that stuff. Symptom-wise, you can sooth the itching with the old Leiber/Stoller ocean-of-calamine-lotion remedy. But you might fare a bit better with an estuary of corticosteroid cream and perhaps a small pond of antihistamines, both of which also help reduce the inflammation. If you’re especially fed up with these sadistic plants, you can also try moving to Alaska or Hawaii, both of which are Toxicodendron-free. However, you may just be trading in contact dermatitis for bigger problems like bears and volcanoes. So at least wait for the swelling to subside before making any rash decisions. Don’t eat these. They’re not ready. Image via Abhishek Jacob. BTW, cashews are related. 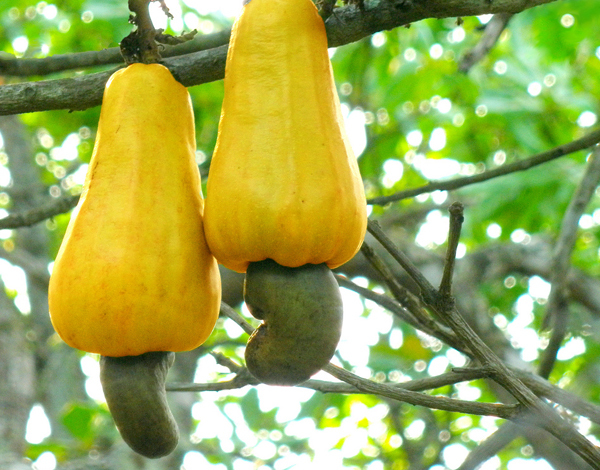 Cashews are another urushiol-harboring plant in the Anacardiaceae family. Yes, delicious snack-tastic cashews were once scary, toxin-coated itch bags. The nut (well, drupe technically) is housed in a double shell, and it is in the shell itself that urushiol is found. When cashews are processed, their shells are removed and any lingering poison is carefully cooked from the nut (even “raw” cashews are steamed before they hit the market). This explains why cashews are so under-represented in bowls of unshelled nuts waiting to be opened with a festive nutcracker. Cracking a walnut is one thing, but unleashing cashews requires protective clothing. * Poison sumac is the exception, non-itching varieties of sumac are in the same family as the itchy plants (Anacardiaceae.) But poison sumac is the oddball of the three in several ways. Bottom line: Info on poison ivy, oak and sumac.